If you’re looking for car rental services in Bucharest and Otopeni, you should choose FocusRent, the company with over 10 years of experience on the car rentals market. If safety and a classy appearance are what you seek, FocusRent offers you Ford Mondeo for a price that starts at 40 euro/day, with all taxes included. We’re at your service 24/7, to offer you car rental services that fit your needs. The elegant and modern style of Ford Mondeo is a performance and efficiency statement. Combining a sophisticated and intelligent design with the latest innovative technologies, Ford Mondeo takes the experience of driving to the next level. FocusRent, car rental company that operates in Bucharest and Otopeni, offers you the most reliable, modern and safest cars, at competitive prices. Whether you’re looking for a car to rent for your vacation, or you need one for a business meeting or special event, Ford Mondeo is one of the best options. Rent Ford Mondeo and drive a car that meets the highest comfort and safety requirements, with a trunk that offers sufficient room for your luggage. It comes fully equipped with automatic air conditioning, radio/CD player, front and lateral airbags, ABS and ESP system. 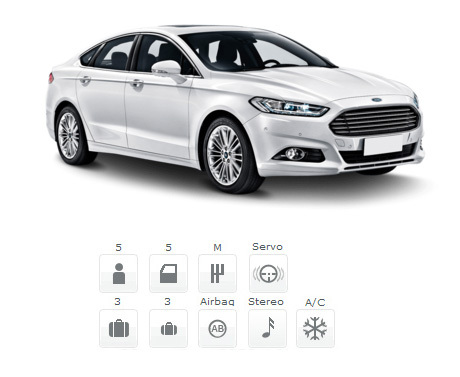 Ford Mondeo, available through our car rental services, also comes equipped with modern safety systems, manual transmission, and an impressive spacious trunk. In addition to fast delivery, FocusRent also offers you a full tank of gas and free replacement of the car in case of damage, in only 5 hours.